Sai Baba : "If I accept one rupee from anyone as 'dakshina', I have to return many more times of it. I never accept anything gratis from anybody nor do I ask for 'dakshina' indiscriminately. I only ask and take from him towards whom the 'Fakir' (God) points out. If anyone is indebted in his previous birth to the 'Fakir", then only 'dakshina' is received from him. The donor gives and sows the seeds to reap a rich harvest in future. Wealth should only be used to earn 'Dharma'. If it is used for personal enjoyment, it is wasted. Unless you have given charity before, you cannot, get it now. So, the best way to receive is to give. The giving of'dakshina' leads to Vairagya' (non-attachment) and thereby to 'Bhakti and' Gyan." Sai Baba : "Why should any fear when I am there. Cast all burdens on Me, I shall bear them." Sai Baba : "Have faith in Me. Even though I give up this body, My bones in My Samadhi will give you hope and confidence. Not only I but My Samadhi would be speaking, moving and communicating with those who surrender to Me whole heartedly. Do not feel disappointed that I would be away from you. You will hear my bones speaking and discussing your welfare. If you remember Me constantly and have faith in Me, heart and soul, you shall be greatly benefited." Sai Baba : "Keeping your mind steady continue to do your duty fearlessly and have faith in My words. If My 'Leela's' [deeds] are written, 'avidya' [nascence/ ignorance] will vanish and if these are attentively and devotedly listened to, the consciousness of the worldly existence will abate, and strong waves of devotion will arise. If one dives deep into My 'Leela's', he shall obtain precious jewels of knowledge." 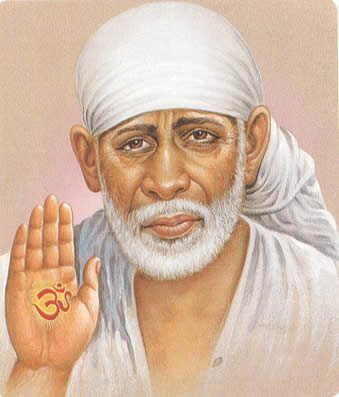 Sai Baba : "My Guru never taught Me any Mantra, how could I then blow any Mantra in your ears? Just remember that Guru's tortoise like loving glance gives us happiness. Do not, therefore, try to get Mantra or sermon [Updesh] from any body. Make Me the sole object of your thoughts and actions and you will, no doubt attain 'Parmartha'-the spiritual goal of life. Look at Me whole-heartedly and I, in turn, will look at you similarly." Sai Baba : "Give [Charity] with faith and magnanimity [liberally]; give with modesty, sympathy and respectfully." Sai Baba : " He who loves me most, always experiences my presence. The whole world is desolate to him without Me." Sai Baba : "If you spread your palms with devotion before Me, I shall immediately be with you at any time of the day and night. Though I am here physically yet I know all that happens beyond the seven seas. Seated in your heart, I am in fact your Inner Self. Always worship Him alone who is seated in your heart as well as in the hearts of all beings. Blessed and fortunate indeed is he, who is aware of My omnipresent and omniscient form."